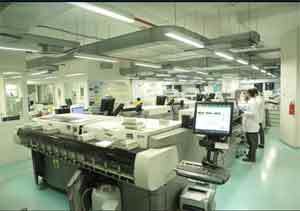 Mumbai: Metropolis Healthcare, a global chain of pathology labs and diagnostic centres, celebrates 35 years of operations in Mumbai crossing a milestone of 500 centres in Mumbai. One of the first laboratories in Mumbai to have been accredited by NABL & CAP, Metropolis Healthcare has played a pivotal role in changing the diagnostic and pathology landscape in the city, India and globally. In last 35 years of operations, Metropolis has offered services to over 6+ million patients every year and performs over 30 million medical tests each year. The last 3 decades has seen the company expand its geographical footprint in India to over 400 cities and globally to Sri Lanka, Kenya, Mauritius, Zambia and Ghana.Equipped with the latest in technology, innovative work equipment, expansive logistics network and rigorous processes, Metropolis Healthcare ensures and delivers precision and accuracy in every single test; each time, every time. Mr. Vijender Singh,Chief Executive Officer says, “Metropolis is delighted to announce this achievement. We now plan to add up 500 more centres in Mumbai in next 12-18 months and about 1000+ centres all over India, Sri Lanka and Africa. We strive to grow with the same enthusiasm and speed in all parts of the country. Metropolis will continue to dominate the market in Mumbai and grow bigger each year”. He added, “India’s diagnostics market is estimated at around $2.2 billion and is poised to double by 2018. To support this growth,we have been building on automation, adopting global best practices and introducing new tests and technologies”. The Global Reference Laboratory of Metropolis, spread over 30,000 sqft, decodes over 10000 clinical cases daily using technology & human expertise. Armed with a widest test menu in the industry and with a team of over 250 laboratory professionals and 21 expert pathologists, we ensure that patients and clinicians get the right diagnosis at the right time. Today Metropolis Healthcare is not just a leading scientific laboratorybut a holistic wellness partner to patients, clinicians, hospitals, laboratory partners. With 500 centres and 11 laboratories in Mumbai, we work on a hub and spoke model – one lab connects to several collection centres in an area. Metropolis has been expanding its spokes in a large way which enables the lab to give faster reports and better quality experience.